With increasing traffic at the beginning of the 20th Century, the Great Eastern Railway (GER) found it needed a series of locomotives which more powerful than the existing Claud Hamilton 4-4-0s, but with a light axle loading and a short wheelbase suitable for the GER lines. These latter restrictions resulted in S.D. Holden's design being notably smaller than most British 4-6-0s. Officially designated Class S69 by the GER, they quickly became known as the "1500" Class after the first locomotive built. The LNER would give them the classification of B12, and would find the combination of low axle loading and short wheelbase very useful attributes. As an evolution of the Claud Hamilton design, the driving wheels were reduced from 7ft to 6ft 6in diameter, and the boiler was increased to the limits of the locomotive's dimensions. The cylinders were kept in an internal position, but were increased in size to 20x28in. The Belpaire firebox was located over the middle driving axle. A large cab was fitted. This in combination with the GER standard tender, resulted in a locomotive which looked larger than it really was. The large cab resulted in an 8ft distance between the firebox door and the tender, requiring the fireman to use a long-handled shovel. Although design work started in 1908, construction of the first B12 would not start until 1911. The GER built a total of 70 B12s in eight batches before Grouping. This does not include No. 1506 which was destroyed in a collision at Colchester on 12th July 1913, only seven months after construction. A replacement was built (No. 1535). No. 1504 was built with a 1.5in side traverse on the trailing coupled axleboxes, allowing increased flexibility on curved track. This had been tried experimentally on "Decapod" 0-10-0T in 1902, and would be adopted as a standard feature on the B12s. Nos. 1500-3 were altered accordingly. Initial allocations of the B12s were to haul expresses on the GER line to Colchester and Norwich. As more locomotives were built, they started to work all of the GER express services to London including the Cambridge services. In the late 1920s, increasing train weights and poor quality fuel, led to a desperate need for additional power for express passenger services in the GER District. Previously planned Gresley K2 2-6-0 engines helped, and a three-cylinder 4-6-0 design was in preparation (this would become the B17 'Sandringham' Class). However, a stop-gap was needed and a final batch of ten B12s were ordered. These differed from the originals with the addition of Lentz oscillating cam poppet valve gear, no decorative framing over the driving wheels, and the smokeboxes were slightly longer. The rear axleboxes were not fitted with the side traverse facility. These would be given the classification of B12/2. During the mid-1920s, the LNER performed a series of B12 bridge tests on the former Great North of Scotland (GNSR) lines, due to an urgent need for greater power. Although the tests were successful, the GER's shortage was critical and transfers to the GNSR district did not take place until 1931 when the GER's shortage had been relieved. Transfers continued over the next ten years, resulting in 31 B12s allocated to Scotland by 1942. Initially these Scottish B12s were allocated passenger services between Elgin and Aberdeen. They were later also used on the coastal Elgin line, the Buchan section, and the Deeside line; and also operated goods and fish services The Scottish B12s would continue to work the heaviest of these services until the arrival of the Thompson B1s in 1947. During the 1920s, many of the B12s participated in Gresley's Feed Water Heater experiments. These attempted to recover waste heat by using the exhaust steam to pre-heat the water before it entered the boiler. In 1926, No. 8509 was fitted with a Worthington-Simpson feed pump and heater, but this was removed in 1929. From 1927, 55 B12s were fitted with ACFI (Societe l'Auxiliaire des Chemins de Fer et de l'Industrie) feed water heating apparatus. This apparatus was mounted above the boiler, and consisted of two heater drums and a single steam cylinder which operated two water pump cylinders. The first of these drew water from the tender into one of the drums where it mixed with exhaust steam. The heated water flowed into the second drum, where the second pump drew it into the boiler. All three cylinders were double acting. B12s fitted with the ACFI heaters were popularly known as "hikers" due to their appearance of carrying a hiker's backpack above the boiler. The ACFI apparatus was removed when B12s were rebuilt with larger boilers to B12/3, between 1934 and 1941. Maintenance costs of the ACFI apparatus were found to be higher than the savings in fuel. One of the main problems was that the system tended to scale up and required acid cleaning every six weeks. This cleaning in turn tended to damage pipe joints. The Scottish B12s used softer water and did not suffer this scaling problem. These would be the last to have their ACFI apparatus removed, in 1941. Between 1932 and 1944, all ten B12/2 locomotives and 44 of the original B12/1s were rebuilt with larger diameter boilers and long-travel Stephenson piston valves. The Belpaire fireboxes were replaced with round-topped fireboxes. These were given the classification of B12/3. The GNSR District continued to have limited axle loadings, so the GNSR allocated B12s could not be rebuilt with the larger diameter boilers. Hence between 1943 and 1948, nine B12/1s would be fitted with new boilers of the original smaller size but with round-topped fireboxes, and given the classification B12/4. This new boiler was to current LNER standards, and was shared with the J20 0-6-0 locomotives. During World War 2, the GER district B12s were often called upon to haul some extremely heavy loads. Age and wartime maintenance led to them not being in the best of condition, but they were still capable of hauling 480-490 ton trains when required, even if it was a struggle. After D-Day, a number of the B12/3s were allocated to American ambulance trains. Their restricted loading gauge, light axle loading, and short wheelbase allowed them to run across most Britain's railway network, although they mainly worked in South West England. Excluding No. 1506 which was destroyed in the Colchester accident in 1913, the first withdrawal was No. 8534 in 1945. This was one of the remaining B12/1 Belpaire firebox locomotives, and all of these B12/1s would be withdrawn by 1954. The B12/4 locomotives were withdrawn between 1948 and 1953, with their boilers being sent to Stratford for use on the surviving J20s. The large-boilered B12/3s would survive the longest. These were withdrawn between 1947 and 1961, with the last B12s hauling services between Norwich and Cromer, and occasional visits to Liverpool Street. From 1959, No. 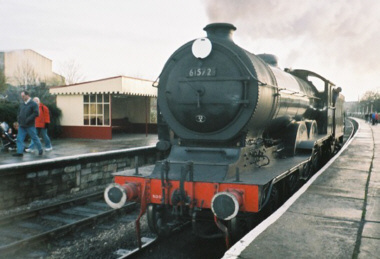 61572 became the sole surviving B12. As well as regularly hauling the Yarmouth to March parcels train, it also hauled an increasing number of rail tours. Withdrawn in September 1961, No. 61572 has been preserved. Heating Surface: Total: 1834.2 sq.ft. 1874 sq.ft. Firebox: 143.5 sq.ft. 154 sq.ft. Grate Area: 26.5 sq.ft. 31 sq.ft. No. 8572 (BR No. 61572) was the last surviving B12, and survived much of the 1960s as a minor celebrity running rail tours in BR ownership. No. 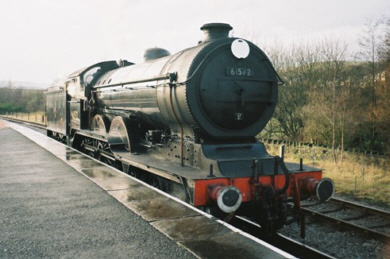 8572 was purchased by the Midland and Great Northern Joint Railway Society who still own and operate it. Usually based at the North Norfolk Railway, No. 8572 occasionally visits other preserved railways. An excellent article about how No. 61572 was saved appears in the August 2005 (No. 76) issue of Heritage Railway , on pages 44-49. B.H. Enterprises sell whitemetal kits of both the original Holden B12 and Gresley-rebuilt B12/3 versions, in N Gauge. Union Mills have produced a ready-to-run model of the B12 in N gauge. This is currently out of production, but might be produced again in the future. Finney and Smith produce a 3mm scale kit of the B12/3. Hornby produce a ready-to-run model of the B12 in OO scale. PDK sell a series of etched 4mm scale kits of the B12 in its various versions. 4mm scale kits are also available from McGowan (B12/2) and Crownline (B12/4). Connoisseur produce an O gauge (7mm scale) kit of the B12/3. S.M.Models produce kits of the B12 (GER S59), in addition to the B12/2, and B12/4 variations. Thank you to Dave Martin for the photographs of the preserved No. 8572 operating on the East Lancashire Railway. Thank you to the Mike Morant Collection for the photograph of B12/3 No. 61537. Thank you Malcolm Peirson for the above photographs credited 'M.Peirson'.